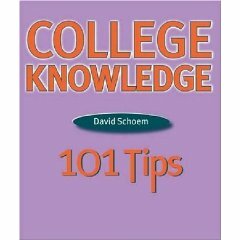 In association with DailyLit.com and the University of Michigan Press, The Gallery Collection is sponsoring free downloads of the book, College Knowledge: 101 Tips, by David Schoem. The free downloads have been made possible by DailyLit.com, a digital publisher that sends books to readers in installments via email or RSS feed. David Schoem is Faculty Director of the Michigan Community Scholars Program at the University of Michigan. Through his years of experience as an educator, he has written this book with the hopes of providing guidance to students entering their first years of college. His book is filled with advice, success stories, and anecdotal tips on how to make the transition into college as seamless as possible. If you’re interested in signing up for free digital installments of College Knowledge: 101 Tips, please visit http://dailylit.com/books/college-knowledge-101-tips. The Gallery Collection recognizes how important students are to the future of America, and we hope this book will be a beneficial resource to those who read it. Next post: What 1993 ghoulish Tim Burton Christmas movie features the character Jack Skellington, who tries to steal Santa’s job?